When I first thought of having a story for my Faybel character, I knew I wanted to incorporate Tarot Cards, the cards popular today for Divination by Fortune Tellers (among others… not trying to stereotype here!). I’m not sure anymore why I wanted such an association between my character and Tarot Cards, but I’m always fascinated by Tarot Cards for Divination and the thought of “bucking fate against the odds and controlling your own destiny” appeals to my sense of place in the multiverse. As soon as I searched for “rules to playing tarot card games”, I found out that is how Tarot developed… as playing cards for various local games… use in divination was added by later generations based on the 78 card deck popularized by the French. I was astounded that Tarot Cards had been the forerunner of our modern 52 cards playing deck and used in games. 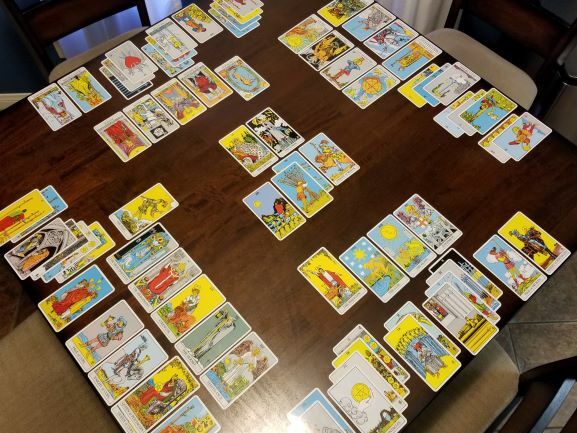 Here I thought I would create my own game surrounding Tarot Cards, but low and behold, such games are ancient history! Awesome! All I need to do is adapt existing games to my story universe to make them work. As I researched Tarot Cards, I found that one route on which they are traced leads to the Italian word “Trionfi” (trionfo?) which means “Triumph”. Liking this word so much, I appropriated it into my Dratak conlang as “Trionfay” which translates as: Win, Guard, Fate… triumph against the odds. I downloaded the rules for playing “French Tarot Cards” and since I already have my set of the Rider Tarot Deck, I used them for the game play. I took photos of the hands I dealt out. It was fun because I’m so new to the game that even though I was playing by myself, I didn’t know enough of the rules to just “know”, from seeing all the hands exposed, who would win the game. I wasn’t surprised when I won the first game from the dealer position because I thought it had the most trump cards and the 21 trump card, which is strongest in the game. I was surprised on my second game when I lost from the dealer position because again, I thought I had the strongest hand… but following the rules of game play, the other 3 positions took twice as many tricks as I could attain. I found that just using the rules, from the link I provided above, is complicated enough of a game, I don’t need to confuse things further by making up my own game rules outright. I decided to just combine games like Poker and Euchre and Tarot to have Trionfay work in my story universe. The only true difference is that in my Akasha Universe, the cards actually have a small influence on an individual’s fate in the multiverse. While most characters believe in this, my protagonist Faybel does NOT believe in Fate at all at the start of her character arc… but changes her tune when she realizes that the Trionfay game she plays earlier in the story is having a direct impact on developments later in the story. So there you have the simple history behind how I incorporate Tarot Cards into my story universe and why I was inspired to name it “Trionfay”. I have the belief that we are set on a course at birth (fate) but we are obliged to ourselves and our society to “guard against fate”, to make difficult choices, to take chances, to get outside our comfort zone, to live life instead of letting life lead us! Unfortunately I feel that most people let life lead them… because it’s their fate, their destiny and there’s nothing they can do about it. Do something about it yourself!